We discovered Bogotá with a local, our friend Cristhian whom we had first met a seemingly long, long time ago in the North of Argentina. We had imagined Bogotá as a scary place where we would not be able to spent much time walking around outside. But far off we were! Thanks to Cristhian, we got to see the city’s nicest corners, were not in danger to get lost in the wrong places, and thus, had a few awesome and fun days in this metropolis. So here is what we did in Bogotá: As we got there on a Sunday, we started the city exploration program with a hike up to Mount Monserrate. This hike is chosen by loads and loads of locals here as their Sunday morning activity. They hike up, take the cable car or furnicular to Monserrate church either to attend the service, just as a work out or maybe also in course of a romantic date. Either before or after this journey up and down, many of them traditionally eat a “Tamal”, a rice dish packed up in a banana leave. We figured, that’s their mountaineering dish like at home probably “Kaspressknoedel”, “Groestel” or “Kaiserschmarrn”. After having enjoyed the view over this mighty big city from up there, we went down again to discover it close up. We mainly concentrated on an area called La Candelaria, the old town area of Bogotá. In some of the small alley ways of this area, where most backpackers choose to stay, one could almost forget that Bogotá is not a small town but a city inhabiting millions of people. While there, we had coffee at the Plaza Del Chorro Del Quevedo, the birth place of Bogotá where at any hour of the day lots of people hang out to just have a good time together with the others that do the same. Later we went on to stroll around Plaza de Bolivar and admired the fat people, cats and fruits painted by Fernando Botero, one of Latin America’s most famous artists and exhibited in the Botero Museum. In the evening we went back to the the Plaza Del Chorro Del Quevedo where we mingled with the crowd of locals and tourists to sip some beers and “Aguardiente”, Colombia’a signature anis liquor. The next day started with a little shopping trip. This might sound lame, but it is actually a very typical activity for the normal local who can choose among various malls in all forms and sizes. However, we did not go shopping entirely voluntarily. Despite that we had been running around in rather run down clothes over the past couple of months, we would have gone on doing that happily if the last laundry service shop that we had chosen would have given us back our clothes… It would be too long of a story to tell in this place, but anyways, we had to get some new emergency shirts and underwear in order to make it through the last couple of weeks in South America. That mission accomplished but still in shopping mood, we went to the Paloquemao market, Bogotá’s biggest market to buy fresh produce. There we bought every fruit that we had not tried till then and also some that we had already fallen in love with. In the end, we had three big bags of fruit. It took us the whole afternoon happily tasting our way through all of them. Another great activity was riding our bikes through town, following the lead of an American guide who has been living in the city for more than 10 years. Thanks to him, we not only discovered some more sights but also quite some hidden corners that tourists normally would probably not find. One of these places for instance, was the Emeralds trading place. As Colombia is one of the biggest producers of this gemstone, that was quite interesting to see. Moreover, the tour supports street performers and artists and makes sure the tourists get to taste some local foods. However, only the brave ones took up the opportunity to try fried ants, one of the local delicacies. While in Bogotá we also visited the Catedral de Sal in Zipaquirá, one and a half hours outside the city. This church was build in a unique setting: the tunnels of a former salt mine, located 200 meters underground. It is quite spooky to visit this place, but also mightily impressive. After the big city life in Bogotá we were ready for some relaxing beach days. Luckily, our next stop was Colombia’s Caribbean Coast! What to do: Go on a bike tour through the city. 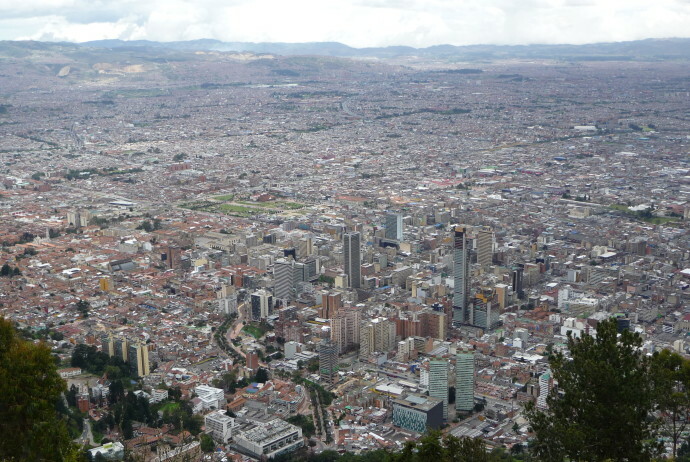 It gives you a quick but still quite detailed overlook of Bogotá. Where to stay: We picked a hostel close to the airport as that was more convenient with our flights in and out of town. The one we picked, Hostel Modelia, is highly recommendable as the owners are very helpful and friendly, welcoming visitors almost like family. If you rather want to stay where the party is, in La Candelaria, try the hostel Masaya Bogotá, we only heard good things about the place. What to eat & drink: Try your way through all the fresh produce at Mercado Paloquemao – it’s fun and there will be new experiences waiting for your taste buds.